Question: I’ve always dreamed of fishing in Alaska, and I’m close to having the money saved up. How can I ensure that my once-in-a-lifetime trip is as good as it can be? Answer: Booking a trip to a place you’ve never been is a leap of faith — especially when there is a lot of money involved — but there are ways that you can protect yourself from making a bad decision. When I was a guide, I was constantly amazed by how few people had bothered to research their destination before getting on the plane. 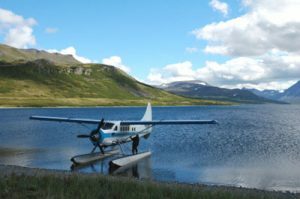 At one Alaskan fly-fishing-only lodge, I was amazed to see two guests arrive carrying spinning gear and Plano boxes full of trout lures. When we told them that their tackle was illegal on our home rivers, they were shocked and indignant. I could cite many more examples of clients whose expectations were out of whack with the realities of the lodge they’d booked. Part of the problem is that most brochures for fishing lodges are full of embellishments and inaccuracies because the lodge wants to paint itself in the best possible light. Always keep in mind that a brochure is an advertisement, so it should be treated with healthy dose of suspicion. And double-check the information that is important to you. There is no substitute for good research. 1. Where do you want to go? Whether you’re heading to Alaska or Argentina or the Bahamas, you have lots of options to consider — ease of access, available water, available species, weather, and more. Do your research, and decide where you want to be. Your final decision may be a compromise that takes into consideration the terrain, the fishing, the weather, and the ease of access. Whereas one person may be willing to brave rain and high winds for a chance at a 30-inch rainbow, another may want better weather, luxurious accommodations, or mountainous beauty, even if it means the fish are smaller. 2. When do you want to go? You have to decide which species of fish you’d like to catch and then plan your trip accordingly. Do you dream of a 40-pound king, or would you rather catch acrobatic silvers? Is your heart set on tarpon, or will you be happy casting for bonefish in case there are no tarpon around? Just because a lodge lists many available species, don’t assume the species you’re after is always available. Most lodges will recommend booking based on the species you’re after — just be sure to ask. Fly fishermen should choose lodges that cater to them, rather than to conventional anglers. Is there a fly shop on the premises? (This is particularly important if you don’t plan to bring flies or aren’t sure what to bring.) Do they fish in fly-fishing-only waters? Are their guides accomplished fly fishermen? How comfortable are the accommodations? What are you willing to sacrifice for the fishing? Don’t set yourself up to be shocked by a lack of amenities. Decide beforehand what you can and can’t live without. What’s the schedule for a typical fishing day? When a fishing day begins and ends — and what time and type of meals are served — are easily overlooked but important considerations. 4. Important steps to take and questions to ask. Remember: It’s your money, so don’t feel that any question is too trivial. And be specific! A. Get a list of references, and actually call them. Pick the brains of previous guests with very specific questions. If you’re interested in dry-fly fishing, ask about it. You may find that, although the brochure says the lodge does it all the time, the previous guests may have never done it. That’s a red flag. Ask about the guides, the food, the schedule, etc. B. Ask what percentage of the lodge’s business is repeat customers. This is a good indication of quality. C. What is the guide-to-client ratio? If this is important, get a written promise that you won’t be left on a sandbar by yourself or stuck in a group of eight with a single guide. D. When is the best time to go? Ask about peak times for the fish and the lodge. If the lodge is booked solid, that’s a good indication that the fishing is good at that time. See if you can get in a week on either side of that. Or, can you book for that week NEXT year? E. What extra fees can you expect? These may include licenses, booze, flies, etc. Don’t set yourself up for sticker shock at the end of a fun week. F. What is the tipping policy? Guests are expected to leave a tip. Most lodges pool the tips, with an equal share going to each employee. Ask what the standard amount is. Then give a little more, if you can. Make sure that you decide exactly what you want out of the experience, and then do everything you can to make sure that you get it. Never settle for less than you want. There are usually plenty of other options. Whenever someone asks me if it’s worth the money to go to Alaska or Belize or Tasmania, I say the same thing: If your ability to have a good time is predicated on catching lots of huge fish, then don’t go. However, these trips are worth every cent for the angler who can enjoy the splendor of the scenery and the wildlife, even if he’s not catching fish. Be prepared to make the best of potential bad situations, and you’ll never be disappointed.